Of course Erik Kratz kept hoping for a moment like this. That’s why he stuck around, through a dozen big league organizations, a couple of cruel demotions in the minors, a bunch of near-misses in the World Series. And the time he accidentally shot himself in the hand with a nail gun. This postseason is full of stars, including Christian Yelich, Jose Altuve and Mookie Betts. Ronald Acuna Jr., Miguel Andujar and Walker Buehler are among the many talented newcomers. To see them here, now, that’s probably not a huge surprise. But Kratz? Starring on this stage? Still scrapping at 38, he’s a .211 career hitter in the bigs, the very definition of a veteran backup catcher. He’s been in the system of all four AL teams that reached the Division Series this year, plus the Brewers. Kratz was with Kansas City in the 2014 World Series, but never got off the bench. He came close in Game 7, lined up to enter if All-Star catcher Salvador Perez had been pulled for a pinch-runner. The next year, he went 0 for 4 in the regular season for the Royals and was nowhere near the playoff roster. Even so, they rewarded him with a championship ring. In 2016, Kratz batted .069 in 14 games for Houston. “I remember Erik Kratz, when I told him he was off our team, he was a proud Astro, so I’m happy when guys succeed when they go elsewhere,” he said. Kratz was in the minors this June when the Yankees traded him to Milwaukee for a player to be named. He impressed the Brewers with his work regimen and knowledge, and produced enough to earn a spot in the playoffs. Against Colorado last week, he became the oldest position player to start in his postseason debut since Lave Cross for the Philadelphia Athletics in the 1905 World Series. “Lave Cross from Milwaukee, yeah, he was a really good third baseman. We played together in rookie ball,” Kratz kidded. “It’s something that is part of history, so maybe in 113 years, some dude is going to be like, Erik Kratz — is it Kratz? What is that?” he said. 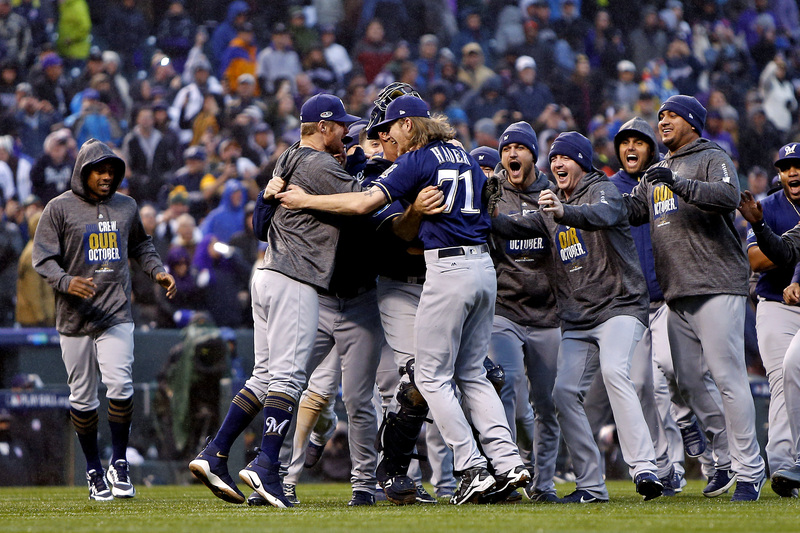 No joke: Kratz went 5 for 8 in the NL Division Series sweep of the Rockies, and his Milwaukee teammates started chanting “MVP! MVP!” at him in the bubbly-soaked clubhouse. “It’s gone from an unsung season to kind of a front-and-center role right now,” Brewers manager Craig Counsell said. During the series, Kratz reflected on his future in baseball. He realizes time is running out. “I haven’t had a good enough career to retire. I’m just going to quit. I’ll just be out. That’s what’s going to happen,” he said.